Turkey has been trying to join the European Union, but calls by the country's president to reinstate the death penalty could jeopardize that. Turkey's president again said he supports reinstating the death penalty, a move that could further complicate the country's relationship with Europe. 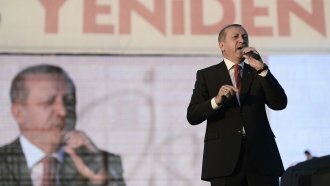 President Recep Tayyip Erdoğan marked the anniversary of a failed coup with a pair of speeches in which he said Turkey needed to forge its own path. Turkey was first recognized as a candidate to join the European Union in 1999. The country has been working to join the union ever since. But reinstating the death penalty would probably knock Turkey out of consideration for good. In fact, the president of the European Commission wrote in a German newspaper that if Turkey embraced the death penalty, the country "would definitively slam the door on EU membership." When Erdoğan's AKP party won the country's general election in 2002, he was seen as having strong European ambitions. This recent speech suggests he's moving away from those original goals. Closing the door on the EU might not be a good idea politically, though. A recent survey found about 76 percent of Turkish people still wanted to join the union.